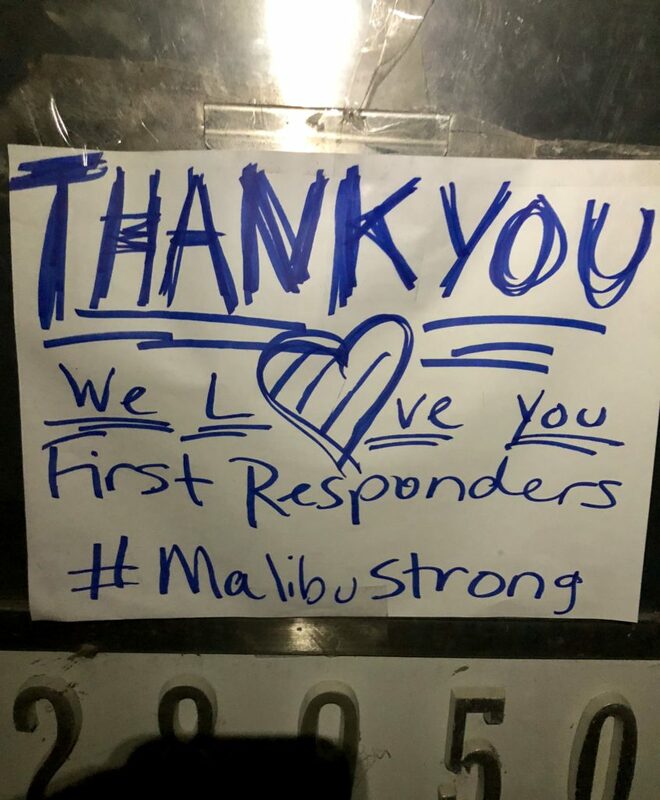 #MalibuStrong | Moms-Pod – A blog. 11/9. 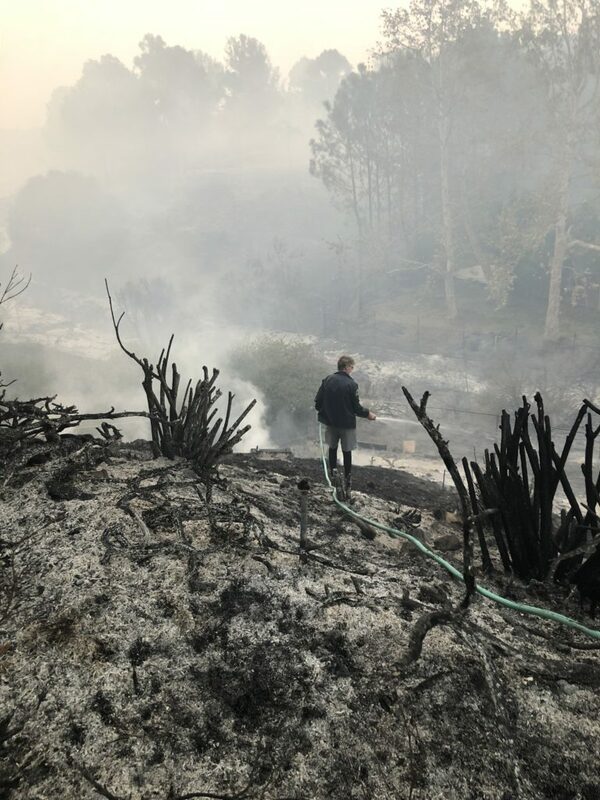 3 Months Later – What are the Lessons Learned from the Woolsey (Malibu) Fire? Two days have drastically changed the way I view life. 9/11 and 11/9. I can’t believe it has already been 3 months since 11/9 when that horrible beast and firestorm ripped through my neighborhood and my heart like a dragon destroying everything in its path. What has happened since then? First and foremost, I am awe of the strength and fortitude I have witnessed first hand. On Thursday, I was able to see so many beautiful neighbors at the Malibu Strong Free Store event at Malibu West organized by Caren Leib. As I listened to their stories, I was humbled and filled with hope. On Friday, I saw Carol, an incredible mom and local who was at City Hall trying to put the pieces of her home back together again. The building plans to her home are now in ashes, but that isn’t stopping her. She is putting the pieces together one day at a time. I also had the good fortune of meeting William at the market and saw the picture of him fighting a 20 foot wall of fire on Dume Drive with only a shovel and a mighty heart. He was the first to step up to help organize the Point Dume Brigade so we are better prepared next time. The City of Malibu was formed in 1991. Many viewed our city’s birth as a good thing because it gave us autonomy to decide land use decisions and keep out massive sewers; however, I personally believe we got the short end of the stick when LAFCO determined that Malibu would only got $.074 allocation of our property taxes. What does $.074 mean? Well, in 2017 Malibu received about $10.4 million in property tax revenue, but LA County received $140 million of our property taxes last year, and over the course of the past 8 or so years they have received over ONE BILLION or so dollars in our property taxes. Surely, Malibu and all tax payers must demand a return on this investment. This City of Malibu, while it does provide services and permits, is not responsible for and can not direct LA County Fire or the LA County Sheriff. All questions about Fire Department Protocol and Sheriff Evacuation Orders and Protocols must be sent to LA County. Supervisor Shiela Kuehl was elected to represent the 3rd District, which includes the City of Malibu. When I served on the Malibu City Council during the October 2007 firestorm, our LA County Supervisor and the Governor came to Malibu to offer support immediately after the fire. When I was Malibu Mayor Pro Tem during the October 2007 fire, the Governor met with me the following day in Malibu, and I was in constant communication with his staff and with Fire Chief Freeman to update the community on the status of the fire at the EOC which was located at Pepperdine and later at the Civic Center. Governor Schwarzenegger’s office also had several follow up meetings with him and other community leaders in Santa Clarita e.g. Has the Governor and/or Supervisor communicated effectively with our community during this past fire? The President of the United States visited Malibu on 11/18/19, and only then did the Governor come to Malibu. Where was our Supervisor? When did she first come to Malibu during and/or after the fire? At the first town hall meeting on 12/13/18, Supervisor Kuehl said her job was to “get out of the way during the fire”. Subsequently, LA County voted to investigate this matter. At the town hall meeting on 1/26/19, almost 3 months after the fire, LA County Fire Chief Osby also promised to investigate and be accountable for the decisions made on 11/9. Who knows how long this investigation and study will take to complete. It could be months or years before we will have answers. I hope you will demand answers to the questions posed. In the meantime here are no brainer lessons. Lesson number 1: Don’t be Missing in Action. Offer Help and Support whenever you can and wherever you may be located. During the next disaster, our elected representative should not simply “get out of the way”. They must stay (if possible and safe), provide information, help, lead and fight for us and along side us. They must show they care immediately and do outreach to our community and any and all officials who can help, including but not limited to the Governor of California and the President of the United States if necessary. Lesson number 2: Set up an Emergency Operation Center at Pepperdine if you have to evacuate and Malibu City Hall is unavailable. If you must evacuate, make sure the City Manager selects a place in or near Malibu that can serve as an Emergency Operation Center for those who stay to fight. In short, don’t be missing in action, but if you are missing in action, do all you can to insure we have some boots on the ground here in Malibu. Coordinate with Pepperdine now to stay there if you must. Lesson number 3: Help get better and more resources for our City, County and State. We need better and more resources.The time to work on this issue is now. We must be creative and explore requesting National Guard and other resources at State and Federal level. Clearly, the program in place now is not working. Lesson number 4: Provide training opportunities now! We need to build resilience and grit on the front lines. We must help train and prepare all who are willing and able to stay and defend and help our community recover. Community Emergency Response Training, Volunteer Call-Fire programs and Neighborhood Fire Alliances must be given top priority now – not after the “investigation” is completed. Lesson number 5: Work as hard as you can to help those who lost everything. The City of Malibu must prioritize the rebuild process and be available a minimum of 8/5 (8 hours a day, 5 days a week) to help those who lost everything.In short, If you can’t commit to a full work-week during the rebuild process, maybe you should find another job. Evacuation procedures and zones must be established to insure we don’t leave people stranded for hours on PCH during the next disaster.For example: It may be safer to simply shelter at the beach near the ocean and not evacuate. Zuma beach and other safe zones need to be established now so people have alternative evacuation zones before the next disaster occurs. Thank you again for your service and sacrifice.